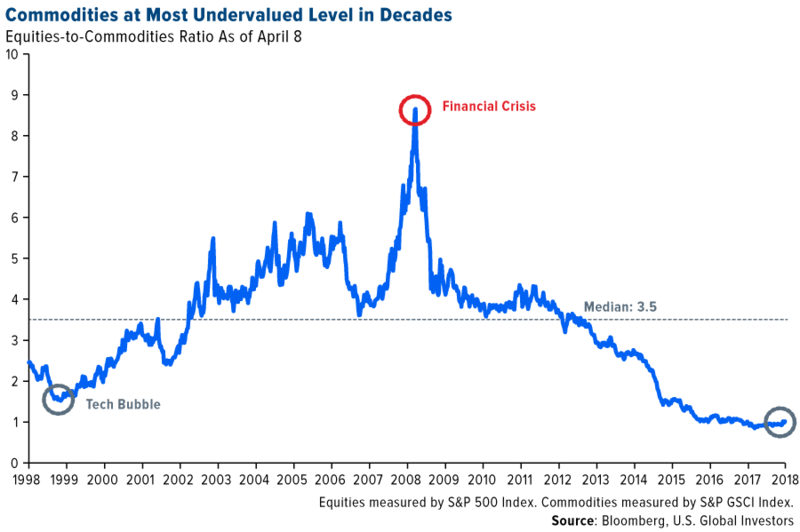 Since the commodities supercycle unwound nearly 10 years ago, many investors have been waiting for the right conditions to trigger mean reversion and lift prices. I believe those conditions are either firmly in place right now or, at the very least, in their early stages. Among them are factors I’ve discussed at length elsewhere—a weaker U.S. dollar, a steadily flattening yield curve, heightened market volatility, overvalued stocks, expectations of higher inflation, trade war jitters, geopolitical risks and more. 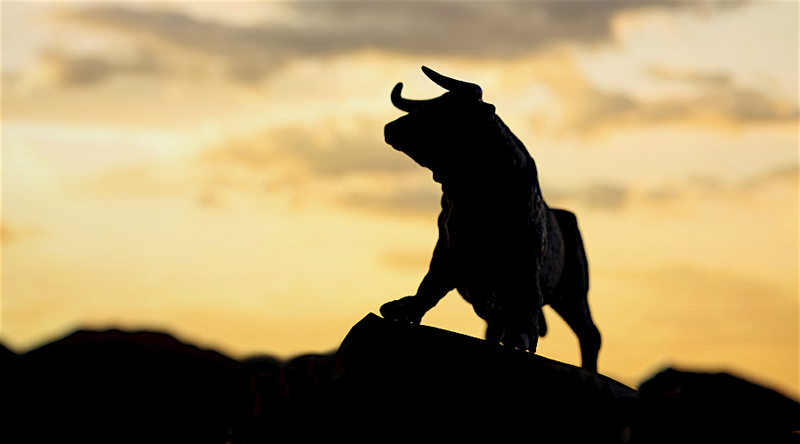 In addition, nearly 60 percent of money managers surveyed by Bank of America Merrill Lynch believe 2018 could be the peak year for stocks. A recent J.P. Morgan survey found that three quarters of ultra-high net worth individuals forecast a U.S. recession in the next two years. All of this makes the investment case for commodities, gold and energy more compelling than at any other time in recent memory. Exhibit A is the chart below, which I’ve shared before but recently updated with new data. Relative to equities, commodities are as cheap right now as they’ve been in decades. This is literally a once-in-a-generation opportunity that investors with a long-term view should seriously consider. For perspective, had you invested in a fund tracking the S&P GSCI or an equivalent commodities index in 2000, you would have seen a compound annual growth rate (CAGR) of around 10 percent for the next 10 years, according to Bloomberg data. We all know that past performance is no guarantee of future results, but it’s doubtful you’re going to get a clearer or resounding signal that now could be an ideal time to add to your commodities exposure. If you feel as if you’ve been stuck at a traffic light these past few years, just waiting to put your foot on the accelerator, you can breathe a sigh of relief because the light may have just turned green. I'm not alone in my bullishness. In a note this week, analysts at Goldman Sachs write that “the strategic case for owning commodities has rarely been stronger.” The bank recommends an overweight position, estimating that commodities will yield at least 10 percent over the next 12 months, with most of the gains being made by crude oil and aluminum. Whereas crude traders are responding primarily to concerns that output could be disrupted by intensifying conflict in the Middle East, specifically oil producer Syria, aluminum prices have skyrocketed following the imposition of fresh U.S. sanctions against a number of Russian firms. Among them is United Company RUSAL, the world’s second-largest aluminum company, responsible for producing as much as 6 percent of global supply. 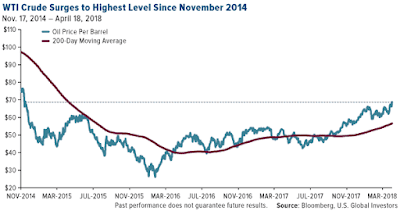 Since its low of $26 per barrel in February 2016, the price of West Texas Intermediate (WTI) crude has surged nearly fivefold and is currently at its highest level in more than three years. On Wednesday, oil jumped nearly 3 percent on reports that U.S. inventories had fallen more than expected, suggesting the global glut continues to recede. Yesterday, WTI tested resistance at $70, a level we haven’t seen since November 2014. But prices retreated again today after President Donald Trump blasted OPEC on Twitter, proving once again how quants comb through social media at lightning speed and use sentiment analysis to inform their trades. “With record amounts of Oil all over the place, including the fully loaded ships at sea, Oil prices are artificially Very High! No good and will not be accepted!” the president said. As I shared with you earlier this month, OPEC and Russia are planning to work more closely together to limit output for a number of years, possibly as many as 10 or 20. Such an agreement would help support oil prices—Saudi Arabia in particular seeks higher prices to take Saudi Aramco, the world’s largest energy company, public—but it’s likely American shale producers would ramp up production to fill the void. The U.S. is now the number two oil producer in the world, having overtaken Saudi Arabia late last year. Will We See $3,000 Aluminum? Aluminum is likewise enjoying a strong rally, jumping sharply more than 23 percent since the White House announced sanctions against select Russian firms and oligarchs in response to the Eastern European country’s alleged interference during the 2016 presidential election. In nine of the past 11 trading days through yesterday, the metal posted positive gains, surging nearly 6 percent on Wednesday alone. Aluminum soared to $2,715 per metric ton in intraday trading yesterday, the highest we’ve seen since April 2011. The rally may have further to run, writes Goldman Sachs, which forecasts a price range of between $2,800 and $3,000 this year. Australian-British multinational Rio Tinto and Melbourne-based BHP, two of the world’s top aluminum producers, were both upgraded to “BUY” this week by CLSA, partly in response to rising aluminum prices but also because they maintain strong balance sheets and are expected to generate favorable free cash flow (FCF) this year. Also bolstering the commodities investment story is China’s massive ongoing “Belt and Road” megaproject, also known as the Silk Road Economic Belt. In a note this week, CLSA reminds us that the infrastructure initiative is still in its infancy, expected to be completed by 2049. It will cut through as many as 68 countries across Asia and Europe, affecting an estimated 62 percent of the world’s population. China has already spent approximately $180 billion to complete various projects, but many billions more will go toward building roads, ports, dams, high-speed rail, airports and more—all to “enhance regional connectivity,” as President Xi Jinping put it, and strengthen China’s economic clout. To give you some scale as to how monumental and historic this undertaking truly is, the graphic below, courtesy of BHP, compares the development to the U.S. Marshall Plan, then one of the most expensive projects in human history. 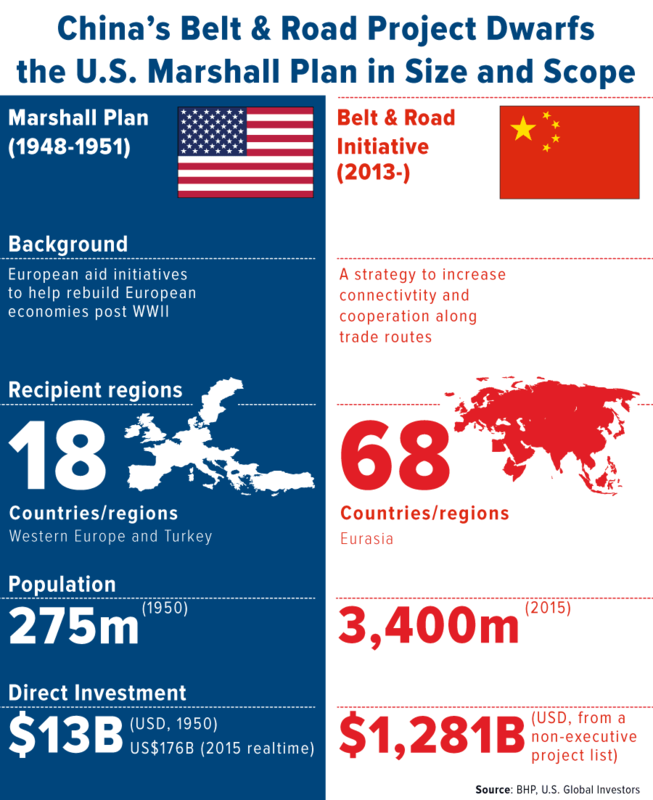 The Belt and Road initiative could eventually cost 12 times as much or more, with total spending estimates ranging between $4 trillion and $8 trillion. Estimates of how much energy and natural resources will be needed during the development phase vary wildly, but I think it’s fair to assume that demand will continue to be supported for some time. Gold ended the week down slightly, the first time in three weeks it’s done so. It looks as if gold investors took some profits late in the week after the yellow metal came close to breaching $1,360 on Wednesday. I still believe gold could hit $1,500 an ounce this year on rising consumer and producer prices, which I think are understated. This is more than apparent when you compare the official U.S. consumer price index (CPI) and alternative measures such as the New York Fed’s Underlying Inflation Gauge (UIG). And as Dr. Ed Yardeni points out in a recent blog post, the word “inflation” appeared as many as 106 times during the latest Federal Open Market Committee (FOMC) meeting, a sign that Fed members could be getting more and more concerned about mounting inflationary pressures. Recent reports also suggest gold production is slowing, which could help support prices long-term. Exploration budgets have been declining pretty steadily since 2012, after the price of gold peaked, and fewer and fewer large-deposit mines are being discovered. This week the China Gold Association announced that the country, the largest producer of gold, produced 98 million metric tons in the March quarter, down some 3 percent from the same period last year. This comes after total Chinese output in 2017 fell 6 percent year-over-year to 426 million tons. Granted, miners have been pressured by Beijing to curtail production as part of the government’s enforcement of tougher environmental protection policies, but the decline in output is part of a downward trend we’re seeing across the board, especially among major producers. Since the news hit April 11, Barrick is up about 3 percent, even after a Friday selloff. On a final note, Franco-Nevada, one of our favorite players in the gold space, recently celebrated its 10- year anniversary as a publically-traded company. As if to commemorate the occasion, the company reported record sales and profit in 2017, not to mention a record $167.9 million in dividends paid—all while staying debt-free. “I am pleased that Franco-Nevada’s 10th full year since its IPO was its best year ever,” commented CEO David Harquail. I’d like to congratulate my good friends Seymour Schulich and Pierre Lassonde, who conceived of the gold royalty model and cofounded the company back in 1983. (As I’ve explained before, Franco-Nevada was the first IPO I worked on as a young analyst in Toronto.) Seymour and Pierre are true rock stars in the world of gold mining, and what they’ve managed to achieve is nothing short of legendary.